Prior to the release of 1998 Proof Gold Eagles, the nation’s official gold collectible coins had never seen such low mintage figures. The Proof Gold American Eagle had stable demand through the early 1990s, following the 10th anniversary in 1995 the coins all trended downward to a bottom point in 1998. 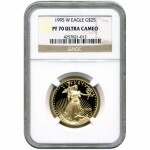 Right now, 1998 1/2 oz Proof Gold American Eagles are available to purchase online at Silver.com with perfect certifications. Ships inside of a protective plastic slab from the NGC! 12th issue of Proof Gold American Eagles in 1/2 oz weights! Availability limited within the original 25,374-coin mintage! On the obverse is a design of Lady Liberty. The reverse includes the image of American bald eagles. 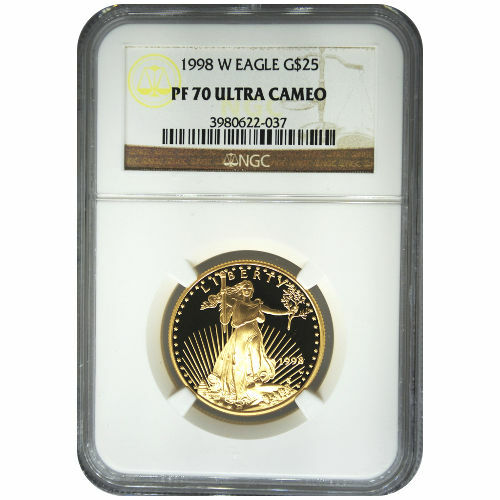 Each of the 1998 1/2 oz Proof Gold American Eagles in this product listing comes with a perfect certification of PF70. 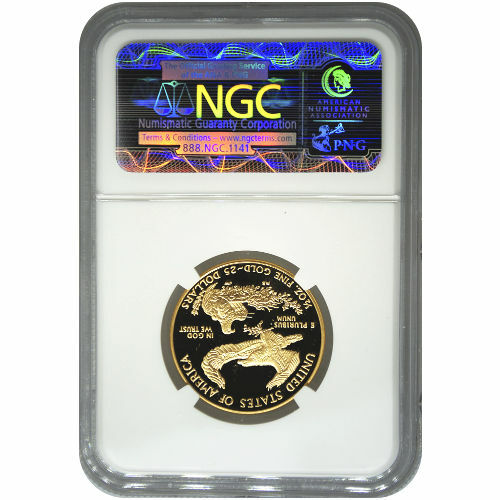 The NGC issues this grade to coins with full, original mint luster and no detracting flaws on the designs or surface areas. UCAM labels are issued to coins with a finish known as ultra-cameo. The visual brilliance of this coin includes strong, frosted design elements and deeply-mirrored, clear background fields. The mintage of 1998 Proof Gold American Eagles marked a low point in demand for the coins at this point in the history of the Proof Gold Eagle. The 1/2 oz Proof Gold American Eagle’s mintage of 25,374 coins in 1998 was the lowest of any of the four coins since the 1986 introduction. On the obverse of the 1998 1/2 oz Proof Gold American Eagle coin is the image of Lady Liberty. This vision of Liberty was created in 1907 by Augustus Saint-Gaudens as a uniquely American depiction of Liberty that would usher American coinage into the 20th century. The reverse side of 1998 Proof Gold American Eagle coins features an exclusive design. This image of American bald eagles was created in 1986 by Miley Busiek and does not appear on any other coins from the US Mint. If you have any questions, please feel free to reach out to Silver.com. You can call us on the phone at 888-989-7223, chat with us live online, or simply send us an email.